Day three of the Brick Works Thin-Tile Vault Seminar – and second day on the site – kicked off with a collective effort to finish the wooden formwork. Once finished, the wooden formwork was carried and installed to the site, a process that required a lot of manual labour. Laser-cut cardboard pieces that will be used as guides for the construction process were then attached to the wood. 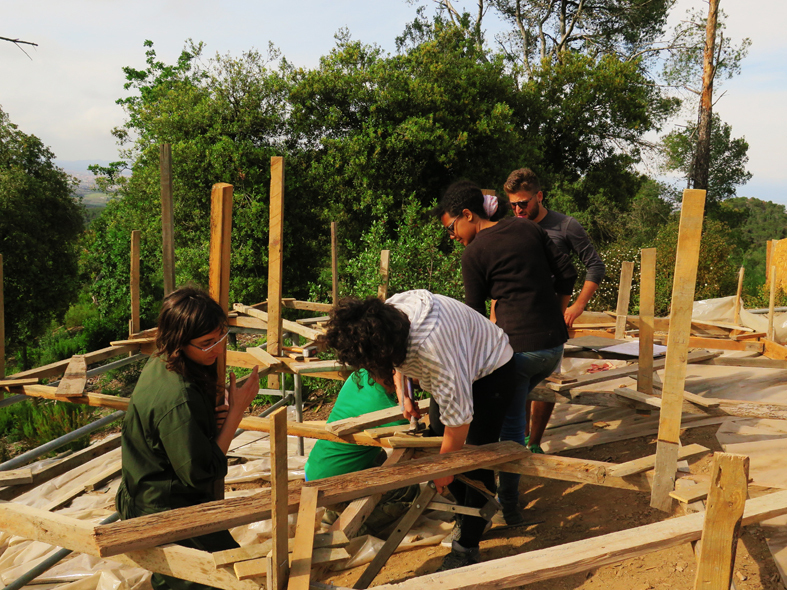 The concrete foundations were laid, always keeping in mind the protection of the soil, as the site is situated in the heart of the Collserola natural park. Sheets of plastic were introduced before the concrete was poured, in order to prevent contamination. After a full day of hard work, students and staff set up a sunday barbecue in the Masia terrace, while the sun was setting behind Montserrat. Most preparations are now over and construction with bricks can start in the next session, a week from now. This entry was posted in IaaC Life, Uncategorized and tagged Collserola natural park, construction, practise fabrication, preparation, prevent contamination, staff, start, students, works. Bookmark the permalink. Post a comment or leave a trackback: Trackback URL.